All this week, south-eastern Queensland has been getting a pasting from the weather gods. We’re still anchored in Mooloolaba, waiting for the deluge to stop, for the wind to ease, and for the 5 metre swells to die down. The rain’s been astonishing. Sometimes I put my hand out of the companionway hatch and it feels like I’ve stuck it under a bath tap. We hear stories of power lines down and major roads out of commission, with 150 mm or more of rain falling in just 12 hours. The winds have been exciting, too. They were forecasting 45 and 55 knots (+/- 40%) out to sea. I haven’t been monitoring our local wind speed (the indicator is on deck, in the rain) but during the nights the anchor chain has been groaning under the strain and at times Pindimara was bucking like a bronco. All around us, yachts have been dragging their anchors, which is not too great when you consider that we’re packed like sardines into a canal lined with millionaire mansions. One guy on a 42 metre yacht woke up to find himself 50 metres downstream and practically inside somebody’s lounge room. He wasn’t the only one, and we’ve seen a few people motoring nervously about trying to find some extra swinging room. Our anchor has set just fine, and it hasn’t moved at all… although with all the pressure on it I imagine it’s pretty well dug in by now, and I’m not looking forward to trying to hoist it when we leave. The canal water is thick and brown and full of flotsam from upstream. In a brief moment of calm I climbed the mast to fit a new anchor light, and from my vantage point I could see that the whole surface of the canal is slick with oil washed down the storm drains from the roads. There’s a whole lot of water out there; the canal is running so fast that the tide didn’t get a chance to come in, and Pindimara remained pointed upstream all day. One day we went ashore to do the laundry. 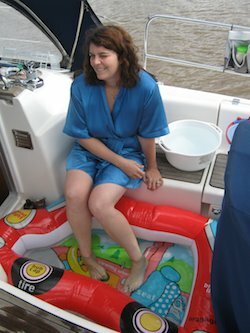 When we returned to the dinghy it was full of rain water, and I actually wore out my bailer trying to get rid of it. At one point, with the bailer splintered down to half its original size and a new cloudburst sweeping in from the sea, I found that I couldn’t empty the boat faster than the rain was filling it. Thank goodness that all our nice clean laundry was sealed into dry-bags. The yacht’s usually pretty waterproof, but on one occasion we must have left one of the three locks on the head window ever so slightly loose. Usually this might have resulted in a few dribbles on the floor of the shower, but a couple of hours of this current downpour filled the bathroom with several inches of water, and when we got back the water was lapping at the lip of the bulkhead into the lounge. That would have been messy. One good thing is that when the dinghy fills up overnight, we can pump the nice fresh rain water straight into our tanks, although this morning I did wonder if it would sink before I could get started. Apart from the gale warnings, the weather forecasts are quite vague, peppered with “depending on movement” and “maybe lower”. I downloaded some GRIB files and quite frankly I don’t blame the forecasters. It’s anybody’s guess what’ll happen next. Just for fun, here’s a graphic representation of the wind strength data earlier today. Red arrows indicate Force 8 to 9. See that confused bit where all the different coloured arrows are stacked up on top of each other? That’s where we are. Since we had so much fresh water, and since the canal is not really suitable for swimming, we decided to have a bath. We have a kid’s inflatable paddling pool that exactly fits inside the cockpit. Add a dinghy-full of rain water and a few pans hot from the stove, and Robert is your mother’s brother. This entry was posted in Australia, Oceania, Travel, Voyage of Pindimara and tagged Gale, Mooloolaba, Sail on 2009/05/20 by Reinhard. editorial note: Reinhard does not ‘climb’ the mast. He is hoisted by the other crew member. He is much heavier than he looks. Love that wind direction file. we are at the epi-centre of all of the weather. How does that keep happening? ?